Thanksgiving is almost here! The menu is planned, the pumpkin roll is in the freezer already, and the guest list has been confirmed; now it’s time to think about the table. Whether you have a formal dinner in your apartment or if you are in charge of decorating the table at your grandmother’s home across town or across Texas, we’ve got some great ideas for centerpieces that will lend a festive air to any Thanksgiving dinner. Now let’s get to work. We all know pumpkin is wonderful for pie, but it can also double as a vase, aka, a centerpiece for your table. Get step-by-step directions for how to create your own pumpkin vase in this guide, complete with pictures. What do pinecones, clementines, pillar candles, and floral stems have in common? They can be combined to make a simple yet elegant centerpiece for your holiday table. Learn how to do it yourself here. Make an autumn leaf bowl and fill it with assorted wrapped candies. Combine the dish with a thankful tree for a unique centerpiece. Cranberries and candles pair to make an easy, beautiful centerpiece for your dinner table or sideboard (some may argue that it looks better than cranberry sauce tastes!). Check out the website for materials needed and instructions to create this centerpiece. Also see this website for additional Thanksgiving table centerpiece ideas. Check your apartment to see what supplies you may already have, and then head to your favorite Dallas craft store to pick up anything you need to complete a new centerpiece for your Thanksgiving table. Beautiful centerpieces certainly add to the gathering, but amidst the food, family, and fun, let’s remember to keep the thankfulness in Thanksgiving. Take time this month to send a text, write an email, or send a note or flowers to someone who has made a difference in our life. Feel free to share pictures of your centerpieces in the comments. 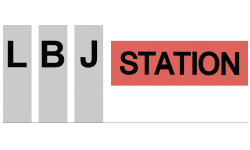 Thanks for reading the LBJ Station Ltd. Blog today. Happy Thanksgiving everyone!